One thing is for sure. 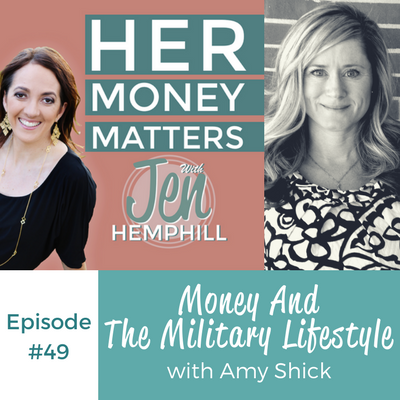 When it comes to dealing with multiple moves and succeeding with personal finances, no one does it quite like Amy Shick! Once you listen to her interview you will understand her success with her personal finances (and learn a thing or two). I’d love to hear from you, what was your favorite part of this episode? [0:00:26.7] JH: Hey there, this is Jen Hemphill, thank you so much for taking time out of your busy schedule to tune in to this podcast. I know there are so many great podcast to listen to and the list of podcast to choose from is growing every single day. It means a lot that you’re here tuning in and listening to this particular show. I want to remind you or if it’s your first time listening, I want to make sure that you know about it too but today, if you’re listening to this episode when it is released on Thursday May 12th before 9 PM eastern standard time, that’s the key. Thursday May 12th when it’s released before 9 PM eastern standard time, you have the last chance to grab a spot in the Fearless Money Sisterhood monthly membership program before the price goes up. Currently the price is $25 a month, that is completely a no brainer price and if you are listening in after 9 PM eastern standard time on Thursday May 12th, you’ll miss out on this and it will be open again on July 1st. What the changes are, I’m going to be doing quarterly enrolment instead of ongoing enrolment. So the next enrolment period is going to be July 1st and the price is going to go up and there’s also going to be an enrolment fee as well. It will still be value packed, it will still be a no brainer offer. So if you’ve been contemplating joining us at all, I suggest you grab this deal now because if you like special deals, this is it. $25 a month, you can cancel at anytime before, and the price will go up after 9 PM eastern standard time today, Thursday, May 12th. So I wanted to make sure you’re aware of that, you can go to Jenhemphill.com/fearless if you want to go ahead and grab that. So let’s go ahead and move on to today’s episode. In today’s episode, we have a fabulous woman on the show, she’s also fellow military spouse like myself and you’re going to learn what adventure sport she’s gotten in to and what goal she’s working on. She’s going to share why downsizing on a car was not a good financial decision for them and what lesson they learned from this. She’s also going to share what influenced the decision to invest in real estate and I think this is the first guest to my memory that is talking about real estate, so this is cool. She’s also going to share how having multiple bank accounts has simplified their spending and if you have been following me for a while and know how I personally manage my money, that definitely makes me smile. Let me go ahead and share with you about Amy Shick. She’s an army spouse of 21 years, a mom to three sport loving kiddos, she loves all things real estate and DIY, and along with her husband, they are using real estate investments as part of their retirement plan. She co-founded the Military Property Project with an army spouse and they have merged with Agent Hero and together our building Millie. Let’s not delay and let’s go chat it up with Amy. [0:04:19.8] JH: Welcome Amy to the Her Money Matters Podcast, I’m excited to have you here. Another military spouse, yay for military spouses out here. So excited to have you Amy. [0:04:31.8] AS: Thank you so much Jen for having me on the podcast. [0:04:35.4] JH: Well, you ready to dive in? I’ve got questions for you today. [0:04:40.7] JH: Perfect. Well tell us Amy, we know that you’ve been a military spouse, an army spouse for 21 years, you’re a mom of three, and you are into real estate. So I’m going to have some questions about that, but tell us a little bit more about you, maybe something that not many people know about, maybe something that you really love to do and you just don’t necessarily share all the time. [0:05:010.5] AS: I did and it’s a lot of fun. So I’m out there with the kids and I now will attempt the jumps. I don’t always make a perfect landing, but at the end of the year we have this huge event, it’s called March Madness, and they create like a 40 foot pond at the bottom of the hill. So we have the pond skip. You snowboard or ski down the hill and try to make it across the pond, it’s ice cold water, we’re in Alaska. So I have been practicing all winter because I really want to make it across that pond and usually it’s kids and teenagers that are participating in this event but I just decided, this is the year, I learned how to snowboard by myself, I’m so proud of myself. I may end up in the water, but I’m really excited just to give it a try. [0:06:06.9] JH: I am bowing down to you, I am not that adventurous. I have tried skiing but I never tried snowboarding, I do know I do not like to ski. I was not coordinated enough, it was just basically getting in and out of those boots was just a pain. I had to throw myself, it was just not a pretty sight. But anyways, I bow down to you because I love that adventure side of you. [0:06:32.1] AS: I know, I surprised myself actually. [0:06:36.4] JH: That’s awesome, that’s great and tell me a little bit about how you grew up around money? [0:06:43.6] AS: When I was young, my parents had four kids, very young and very close together and it was a struggle to maintain the family finances, it was just a struggle financially. As I got a little bit older, my parents went back to school and became nurses and that really helped, and I saw that through education you can improve your lifestyle and can improve your financial position. It takes work but my parents were willing to do it and it was great. But my parents were also very conservative with money because of course they did have the four children. I learned the value of a dollar very early. My parents will give me chores that I could earn money for, my grandmother would pay me $10 to was her car when I was little and as I got older, if I wanted something, I really had to work for it. So I think that’s where my desire to create a business started at a very young age. I was always coming up with ideas of how I could make money. Some of them were not as successful as others, but when I was in middle school, I had a horse and my parents said, “We will pay for the boarding but you have to work to feed your horse, you have to buy its’ hay and its’ grain.” So I cleaned fowls at the stables, which of course is like the worst job you can have, is cleaning stalls. I had anywhere from three to seven stalls that I would clean. Every day when I went to the barn, first thing I had to do was work and get those stalls cleaned and keep my job and I made $5 a week per stall. It doesn’t seem like much but at the time, it was a lot. I was 13 years old and so I’ve always seen money a certain way but as — which was something that wasn’t supposed to be wasted, right? There was nothing frivolous really about our lifestyle and my parents worked very hard. So seeing them and seeing how hard they worked for our family, to give us kids the things that they wanted to give us, I had a great appreciation for that and a great appreciation for money. When Jason and I got married, I was 18 years old and two weeks out of high school. Now for the first time in my life, I’m actually budgeting our entire life and that is everything from insurance to groceries and talk about sink or swim, right? It was — there were definitely just some noodle and spaghetti sauce dinners for us in the beginning. Because I wasn’t doing a very good job budgeting money. So it took me a while to really get a system in place and it’s been a journey. I mean even when we were in our 20’s, I still would make mistakes with money. Even now, we’ve made different mistakes with money and we’d learn from them and we just learn from them and go on but we’re always educating ourselves. [0:10:30.3] AS: And we try not to make the same mistake twice. [0:10:34.7] JH: I hear you, it’s definitely a journey and you just evolve, sometimes you have to adjust, hit refresh, do something else that works. Especially as military families, we have to adjust every time we move, adjust the budget because it’s different in the new place things, change, right? [0:10:55.1] AS: Oh finances change significantly. When we left Georgia and then came up to Alaska, just the difference in the cost of groceries, I mean it was shocking and I’m from the San Francisco bay area. It’s pretty expensive to live there but I was surprised when I saw a mango for $5.77, I thought to myself, “Oh my gosh, you’ve got to be kidding me!” But we’re in Alaska, how did they get that mango here right? They had to ship it. I think that is quite a challenge because you are moving to such varying areas. [0:11:40.0] JH: Absolutely. Now, tell me how you got into real estate investments. Since you’re a military spouse, you all move around, tell me a little bit about that? [0:11:53.6] AS: Growing up, my grandmother was a realtor and she had several rentals around the San Francisco Bay area. There were times that I would be with my grandmother and we would stop at a rental to take care of a problem or to assess a problem or to drop keys off to someone. I felt like that was normal for someone to drive by and put an envelope in her mailbox, and drop off their rent. So I grew up with that and those investments and kind of seeing how — the good and the bad of it. As I got older, I saw that those investments, that is what my grandmother, what took care of my grandmother when she stopped working was the cash flow from her rentals. Some rentals were beautiful homes and then others were — I mean I didn’t even like to stop by. They were just kind of dumpy little houses but nevertheless, she owned them and she rented them and kept them occupied, and she did everything herself. My family, growing up, they are very much do it yourselfers. If there was a deck that needed to be built, we were out there helping my parents, everything from going to Home Depot to unloading the wood, to measuring, we were like manual labor for my parents really for years. I guess that’s what you get when you have four kids and they’re all close together, you got to keep them busy, right? [0:14:02.8] AS: So when my husband and I, we bought our first home when I was pregnant with our first daughter and it was — we were graduating from college, I was pregnant and I had this idea in my head that we had to be homeowners, we had to have our own home before our baby was born, right? So we had been searching for a while but this was 2001 in the San Francisco bay area and homes are flying off the market with multiple offers. We spent a lot of time just getting outbid, we couldn’t afford it. We ended up with a condo that was on a four lane commuter road right? It had been a rental for 20 years, we didn’t even live in it the first month, we ended up moving out of our cottage that we were renting, moving in with my parents and that was my graduation gift from college was new carpet in the house. We painted and we tiled and we just cleaned the entire place up and then once that was completed, it took about a month, every night after work and then in between classes and then of course I was in my first and second trimester. We ended up moving in, in May and then our daughter Madison was born in September. So right at the nick of time did we get in there and get into a house. It was expensive, we were mortgage poor I think is what they call it. Our mortgage was almost $2,000 a month, our homeowners dues went in one year went from $200 a month up to $350, we had PMI, our interest rate was at like eight and a half percent, and it was killing us. Here we are, new parents, we both are working, my husband’s still in school and now we are completely married to this mortgage. That’s where budgeting became key, I mean we did not waste a single penny. I became so strict about our budget because it created so much stress. At the time we thought it was a good idea but it did create a lot of stress in that first year of marriage. Fast forward now we’re two years down the road and Jason finally convinces me to commission, going to the army and commission as an officer, he was prior listed in the Marine corps and it took me a while but when we he finally convinced me and we sold that house, or that condo, again, that market was so beneficial that we had several offers and we ended up making a lot of money off the sale of that house, a little over $70,000. [0:17:06.2] AS: We had only owned it in two years. [0:17:08.0] JH: That is wonderful. [0:17:09.6] AS: It was — that really to me was, we put in a lot of sweat equity into that property and it paid off. It really paid off in dividends for sure. That was the beginning of it. Now, looking back at it, we probably could have kept the house and turned it into a rental and I have all my family there in my area. So they could have helped us with it, but at the time, we were jumping in and changing our entire life and going from civilian life into the army and now we’ve got our daughter Maddy, and then I was pregnant wit our son Brady, it was just too stressful, so we sold it, that was great. That really was the boomerang that helped us get into our second home that we kept as a rental and also pay off the student loans, right? Then it just helped us get into our third house, we ended up selling that house instead of keeping it as a rental because of the location and the age of the house. Then we bought a second house in Columbus and then we bought a third little bungalow in Columbus that wasn’t a primary residence, it just started out as an investment property, so we did not live there. But essentially our plan is to buy a home at each duty station and when we leave, turn it into a rental. So far, we’ve got the three properties and it’s going very well. [0:18:44.5] JH: That’s great. Now, tell me a little bit like one — based on your experience, what is one piece of advice that if you’re wanting to invest in homes for rental properties like from what you’re experience, what would your one piece of advice that you would say is beneficial to them? [0:19:06.3] AS: I think my piece of advice is that if even if you're not sure if it’s going to turn into a rental property, start the drip in your bucket very early. Even if it’s $75 a month so that — or even $50 a month if that’s all you have and just keep that drip going into a separate savings account so that when you leave, if you do decide to turn it into a rental, you’ve got a nice little nest egg to take care of two or three or maybe four or five months of mortgage payments should it be vacant. Because I think that’s where the most stress comes in to for families is, “If this house is empty, how can we afford this mortgage and then our current rent or mortgage or on post living?” If you start that drip early, by the time it comes to rent that house, you’ve got your little nest egg already built. Then, if you decide to sell the house, well then, that nest egg can obviously go towards something else. You just determine what its new purpose is but I feel like that is the easiest, just the best advice and the easiest way to prepare yourself. [0:20:22.7] JH: Perfect. How about — well, that advice can go for a military, nonmilitary if they move. So I think that’s good. Tell me a little bit about the best money advice you’ve ever received? [0:20:38.0] AS: The best money advice I’ve ever received is from my parents and it took me years to follow it. They hammered it into us for years and growing up but I guess it just took me a little while to really see it and I kick myself all the time for why we didn’t start this earlier and that is “pay yourself first”. That 10% and if you can do more, that’s even better. But that 10% that you’re going to pay yourself before you factor in any other living expenses is so key because at the end of the day, there’s always something to spend money on. But if you put that money away and don’t even consider it part of your spendable income. Now, that’s hard to do when you are, you know, you and your husband are in college and you’re barely making ends meet and you’re having top ramen for dinner three nights in a row, or maybe it’s just you and you’re by yourself. But even $25 a month, you’re really not going to miss it. You really aren’t and when you think about that, that’s like four trips to Starbucks, right? You can do without those four trips, even in the beginning, but when time is on your side and we’ve seen it over the past 15 years. What we’ve built, even just paying ourselves first, that is with your Roth IRA’s and even the kid’s college savings, it’s been amazing to see how much they’ve grown, you don’t really think about it. You just set them as automatic transfers and you don’t even consider that part of your spendable income. [0:22:18.8] JH: Absolutely, I can’t agree with you more. I believe I know the answer but are you the money manager in the home? You have mentioned the budgets, and tell me a little bit about how you manage your money? But the problem was that I also have a husband and he also spends money. So if that meant that if I had the envelope, we weren’t together very much. So if he then took money like bought gas or something, he needed money. We ultimately changed the way we did things and then once USAA, once they started with their online website, we started creating separate accounts for each of these budgeted items. Everything from groceries, to auto gas, to sports, to clothing, auto maintenance. I separated all those accounts out and I just, just like with the investments, I would have this automatic transfers go into those accounts every month and that way I could visually see it, Jason could visually see it, he could get online and check the balances and of course now the app is just amazing, you have it on the app, you can transfer between accounts. It has just made life so much easier because. It also for me, even though I put these systems in place, every now and then, I still overspend, it’s only natural. It’s also kind of trying to help our kids and say, “Okay, well there’s $250, is there a camp that you can go to for $250?” So just different things like that has really helped me in budgeting our money and keeping Jason and I on track. There’s got to be one person that is the CFO and then there’s got to be the team player right? That helps. [0:26:10.2] JH: Absolutely. That’s beautiful that you share that and I’m so glad to see other people doing something similar that I do. Because I have multiple accounts for different purposes as well. So that’s neat to hear someone else, for me, it’s definitely because it’s such a visual because you can on paper say, “Well we’re going to put this amount of money away a month and this amount is going to go towards this, this amount,” but I have to see it. I don’t want to have to go back and do the math. Yes, I’m kind of lazy that way but it’s just so much easier so you could look at it and not worry about it. [0:26:52.2] AS: It’s like an instant gratification in a sense when you go onto that website and you see how things are progressing. It’s just another positive reinforcement that you’re on the right track. [0:27:05.7] JH: Absolutely, I agree. [0:27:07.0] AS: Or, “Okay, well maybe we need to adjust,” and there are so many tools on the USAA website that we use for just seeing like, “Okay, how much have we spent on my highlights and pedicures this year? Am I spending too much money on these sort of things? Or how much are we spending on auto maintenance?” So that at the end of the year, when we review our budget — that’s the other thing that we do is every year, at the end of the year, we review our budget and then we make adjustments for the following year. Now, obviously it’s a lot more difficult when you have a PCS in that year because you almost have to do that twice. We have a spreadsheet that we have built and my husband is like a power point spreadsheet master for all those years in the army. He manages the spreadsheet and that’s like our yearly budget and then we just kind of adjust each month and then sometimes it’s just a proposed budget when we are moving. Before the move, we’ll do a proposed budget and then we’ll just kind of figure out where we miscalculated once we get there. [0:28:19.8] JH: Okay, perfect. That was my next question but you answered it, you use a spreadsheet. What would be, would you consider your worst purchase? So I guess I was just kind of in a whim that I was worried about getting stranded when I saw that a new transmission was going to be almost $4,000, I was a little shocked. However, we have two vehicles that were extremely reliable. Mine, very reliable up to this one point, that we didn’t have car payments on. So when you get used to not having any car payments and then bringing on a car payment, it’s something that I just didn’t want to do, he convinced me that it was the right thing. So we bought a Honda Accord, and we got a Honda Accord that was like three or four years old. At first it was great, I loved it, I was like, “Wow, this thing has the best gas mileage,” I’m thinking economical. But then, what happened is it started closing in on us really quickly and having a sedan with three kids made me realize one, I can’t carpool like I used to. I only have room for one more tile and that just didn’t work with a lot of our carpools. SO now, I was doing a lot more driving and that took a lot more time because I couldn’t participate in the carpools anymore. That is like a novice move, right? Like I’m surprised that I just did not think that one through before we purchased the Accord. The other thing was, it was not very reliable, we had problems with the spark plugs. [0:30:49.7] JH: Interesting, a Honda. [0:30:53.8] AS: A lot of family members have Honda’s and they swear by them and love them. We thought, “You can’t get any more reliable and economical than a Honda Accord.” So we ended up with quite a few problems with it and then I just decided, “I can’t do this Honda anymore. It was a mistake.” So my husband ended up driving that car to and from Fort Gordon. We were racking up the miles on that car, significantly. Then we finally made the decision to sell it, but because we had put so many miles on it, when we finally did sell it, I think we bought it for $19, we ended up selling it for $13. This was like within six months. So not only did we have the car payment and I lost my Sequoia, we should have been so much better off if we just would have fixed the Sequoia’s transmission and kept the vehicle that did not have any car payments on it. [0:32:02.8] JH: That’s an interesting story. [0:32:05.4] AS: It was one of those things, it’s like, “How did we make such a bad decision at this age, at where we are in life?” So I’m back to a Sequoia again and all is well. I mean it’s been great but it is one of those things that you think you’re making an economical decision but sometimes they just don’t turn out to be that way. So I thought, instead of just being miserable with this car and having this car payment on top of these extra maintenance issue, it’s time just to say “see you later” and go to something else, it wasn’t worth the hassle or the money. That was our worst purchase ever. [0:32:53.3] JH: That is an interesting story. I haven’t heard one like that before. [0:32:56.1] AS: And it happened recently too. I mean this is not something that we did in our early 20’s. This is something we did just three years ago. [0:33:04.0] JH: Live and learn I tell you. It doesn’t matter — that is interesting, thanks for sharing that. Who would you say influenced you the most in the area of money? [0:33:17.2] AS: My mom and dad for sure. They talked to us a lot about money and it wasn’t a, “let’s sit down and teach you how to balance a checkbook”. It was more just the everyday conversation of how money can really be your worst nightmare if you don’t manage it correctly, like it can really just eat you up. Or, “This is your money, you control it, it doesn’t control you. And you have to know where your money’s going. You have to budget, you have to follow it,” because if you don’t know how much money you have and you don’t’ know how much you’re spending on things. Then that’s how things spiral and get out of control. My parents are risk takers and so seeing them save and manage and be conservative but then knowing when it’s okay to take a risk, I think is very key. Obviously if you’ve got a young family with three kids, that’s probably not the time to quit your job and start a business when you’re the main breadwinner, right? However, like my parents, once their kids were grown, that’s when they said, “Okay, now it’s just the two of us and we can take the risk of working part time and starting the business.” But my parents would have never have done that when they had four kids in the house and they had to feed and clothe and take care of us all. So also knowing when is a good time to take a risk and how to manage that. I feel like that is key. I wish I would have listened to my parents much younger because there were times I made bad money decisions and then of course I would call my mom and I’d be upset about it, she would never ever rub it in. She would never say, “I told you so.” Or, “You didn’t listen to me.” It was more of just, “Well you’ll learn from this and that’s okay, you’ll learn from it.” They taught me how to be a frugal shopper, how to not buy the first car insurance I go find but to shop around. I think that’s really helped quite a bit. [0:35:40.5] JH: That’s awesome. Sounds like they definitely put you in the right path and you mentioned the book, the Total Money Makeover, would you consider that your favorite book? [0:35:51.8] AS: I would consider that and then the other book that I love is the Millionaire Next Door. [0:35:58.1] AS: The Millionaire Next Door really came into my life at a perfect time because Jason and I were both working in San Francisco, we both were looking, he was in equity’s trader, I was a paralegal for an internet company. We were going for what was shiny and flashy and those jobs that we felt were going to get us to the financial position we wanted to be in. That book, Millionaire Next Door, made me realize that it really, you can build wealth in a very modest and conservative way but it doesn’t have to be the glamorous job, it doesn’t have to — you don’t have to go to law school and become a lawyer or become a doctor. You can sometimes some of these companies that people own like dry cleaners or plumbers, they can have very successful businesses even thought people don’t look at that and say that that’s glamorous. You can still create wealth, it has everything to do with how you spend your money and how you view money and even just his process and buying homes and renting them out and his experience with it and his advice is pretty much what we follow with buying our homes for investment. We don’t buy beautiful big homes that we fall in love with. We buy homes that are going to be great for us but then also be great rental when it’s time for us to go. [0:37:45.4] JH: You hit on a key point. I think too, in my experience, I think to buy properties that you intend to rent, you’ve really have to do your research, it’s the part time — you know, it can be a full time job depending on money properties but you really have to know the market and be willing to do that about knowing the market because it’s a serious investment for sure. [0:38:15.6] AS: It is and really looking at — ‘cause it’s hard not to get emotional, right? When you’re shopping for a home and you’re touring homes and there’s so many homes that you walk into and they’re beautiful and you just can see your family making this place your home. But the reality of it is, do you have to charge a rent that is so high to cover your mortgage that you have significantly reduced your rental market? So that is — we’ve always bought smaller homes and the last home that we bought was a three bedroom, two bath and our kids were not happy. Because two of them had to share a room and they were just like, it was a great house, in a great area, in a great school district, at a great price and we thought, “Well we’re only going to be here for a couple of years and I shared a room growing up and you guys get your room too, it’s character building,” right? [0:39:14.4] JH: Absolutely, absolutely. Well this has been wonderful Amy, I really have enjoyed talking with you today. As you know this podcast is all about making money simple and taking control of it, so how would you finish this sentence? Her money matters because _____. [0:39:35.5] AS: Because it really determines the outcome of your future and how comfortable or how stressed you will be when that age comes up and you’re not working anymore because you just physically can’t. [0:39:49.7] JH: Right, that’s perfect. Well, I really appreciate Amy, you being here. Tell us, where is the best place for people to find you and learn more about you? [0:39:59.6] AS: They can find me on Twitter and Facebook and then they can also find me at Gomillie.com. I’m part of that project, it’s a lot of fun and we’re doing some really great things. [0:40:15.1] JH: Perfect. Awesome, so I’ll make sure to include that in the show notes and thanks again Amy, I’m sure we’ll connect again within our military community. [0:40:26.0] AS: Yes, thank you so much Jennifer. It was great to talk to you. [0:40:28.3] JH: It was my pleasure. [0:40:29.9] AS: Have a great day. [0:40:34.0] JH: Well there you have it, that’s yet another fabulous woman on the podcast and I hope that you enjoyed it as much as I enjoyed talking with Amy. I’m sure you heard the part in her interview about Amy’s love of real estate, and I want to just to briefly, just a little side note that if you’re contemplating getting into real estate, I really urge you to soak up all you can. It can be a good income stream if you know what you’re doing, if you are putting money aside for maintenance, things of that sort and if you put enough time. Of course I’m not discouraging it by any means but like any investment, it comes with a risk, and you can minimize that risk by knowing the market, having those funds aside for things that come up like changing the furnace, whatever the case may be and you also want to make sure that you treat it like a business. Now, I want to go ahead and give a quick shout out to one of our Fearless Money Sisterhood members. Her name is Lara and she is in Australia, and I have to tell you her drive not only towards her goals but to always be in good spirits. She is just always in good spirit, it’s so refreshing and she’s super helpful as well too. So Lara, I just want to thank you for being a part of this sisterhood and just keep up the great work, keep on pressing. So that is a wrap for today, again I want to remind you that today is the last call for grabbing a spot in the Fearless Money Sisterhood membership for only $25. If you take action before 9 PM eastern standard time today, when this episode is released, on Thursday, May 12th, you’ll be able to grab a spot at the current price of $25 and if you don’t, you will have to wait till July 1st of this year when also the price will go up and there is an enrolment fee. So if you’ve been thinking about it, just go ahead and do it and you can go to Jenhemphill.com/fearless. So that is a complete wrap for today. I want to thank Amy for joining us, for just sharing with us her story. It was just a fabulous interview, just — you can check out the show notes, all the different links at Jenhemphill.com/49. Thanks again for joining me and I will talk to you next Thursday.